NAIROBI, Kenya -- Somali hospital and police sources say the death toll from Friday's bombings outside a hotel in Mogadishu has risen to 53 with over 100 injured. Ahmed Yusuf, a nurse at Madina hospital, said that Mogadishu's hospitals are coping to treat the influx of wounded victims who continued to come in Saturday. 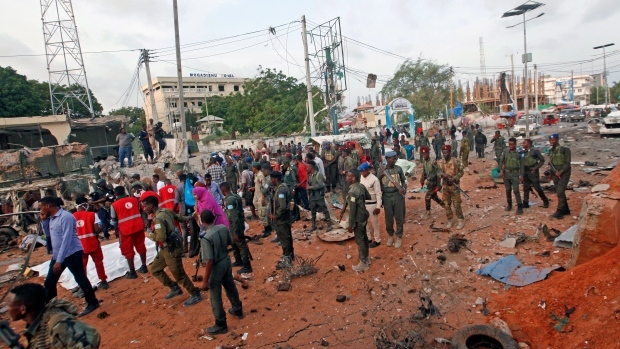 Somalia's Islamic extremist rebels, al-Shabab, claimed responsibility for the bombs.